Introduction: Ultrasonography (USG) is found to be important in identifying various soft-tissue pathologies in the orofacial region. Therefore, its features should be studied and documented in these lesions so that a more appropriate provisional diagnosis can be made. Aim: This study aims to study ultrasonographic features in various kinds of swellings in the orofacial region. Materials and Methods: The study grouped consists of 30 patients of both sexes (20 males and 10 females) with an age range of 15–70 years complaining of swellings in the orofacial region. All the patients in the study were explained the need of tests and subjected to clinical, ultrasonographic, and histopathologic examination. Sonosite Micromaxx sonography machine was used with a linear array transducer of 13-6 MHz frequencies. Ultrasonographic diagnosis is then correlated with clinical and histopathologic diagnosis. Chi-square test and contingency coefficient tests were used. Results: A significant association was observed between clinical and ultrasonographic diagnoses (contingency = 0.872, P < 0.05) and between ultrasonographic and histopathologic diagnoses (contingency = 0.904, P < 0.05). There was 100% congruency between clinical diagnosis and ultrasonographic diagnosis in all the cases except in cases of cysts, abscess, and sialadenitis. Reliability of USG was found to be 97% in diagnosing all the cases with respect to histopathological diagnosis, while it was 90% with respect to clinical diagnosis. Conclusion: USG was found to be a reliable diagnostic modality in the diagnosis of orofacial swellings. The definitive diagnosis of any disease or pathology is obtained with the help of various diagnostic aids such as imaging, laboratory, and histopathological investigation. Computed tomography and magnetic resonance imaging are valuable diagnostic aids, which are expensive and not universally available. Ultrasonography (USG) is an alternative diagnostic tool that is widely available, relatively inexpensive, noninvasive, and easily reproducible. In evaluation of jaw swellings, detailed case history and clinical examination are the most important and mandatory steps. However, in some cases, such as chronic inflammation, abscess formation, deep-seated or infected cystic lesion, and neoplasm, clinical examination does not provide complete assessment of the exact origin and nature of swellings; such cases require additional radiological imaging. Therefore, to get a final diagnosis, clinical examination must be joined with various investigative procedures such as USG. USG is a study of internal organs or blood vessel using high-frequency sound waves, the actual test called ultrasound scan or sonogram. Frequencies between 1 and 10 MHz are mainly used for the purpose of diagnostic ultrasound. Diagnostic USG is an accurate and noninvasive procedure which is capable of showing fine structure in considerable detail. With development of more sophisticated techniques and instrumentation, new applications of its use as an adjunct to clinical practice continue. High-resolution real-time USG is found to be important in identifying various soft-tissue pathologies in the orofacial region. Therefore, its features should be studied and documented in these lesions so that a more appropriate diagnosis can be made. With this in mind, the present study was undertaken to study ultrasonographic features in various kinds of swellings in orofacial region and to evaluate the reliability of USG as a diagnostic aid for diagnosis of swellings in orofacial region. Ethical approval was obtained from the Institutional Review Boards. The study group consists of 30 patients of both sexes and different age groups complaining of swellings in the orofacial region. Convenience sampling protocol was administered to recruit the individuals. All orofacial swellings were considered except swellings due to allergic reactions and insect bite. The individuals were explained about the need and design of the study, and written informed consent was obtained from them before enrollment. Potential benefits of undergoing thorough clinical, ultrasonographic investigations and fine needle aspiration cytology (FNAC)/biopsy procedures were explained. Sonosite Micromaxx sonography machine was used with a linear array transducer of 13-6 MHz frequencies. Among 30 patients in the study group, 14 (46.7%) were diagnosed ultrasonographically as cystic swellings, 8 (26.7%) as lymphadenitis, 1 (3.3%) as sialadenitis, 5 (16.7%) as abscess, 1 (3.3%) as benign salivary gland tumor, and 1 (3.3%) as benign odontogenic tumor, while histopathologically, 13 (43.3%) were diagnosed as cystic swellings, 8 (26.7%) as lymphadenitis, 1 (3.3%) as sialadenitis, 5 (16.7%) as abscess, 1 (3.3%) as benign salivary gland tumor, and 2 (6.7%) as benign odontogenic tumor. In the study, “six” ultrasonographic parameters were used. The “shape” includes “five” terms – “round,” “oval,” “lobular,” “polygonal,” and “unable to classify.” The “boundary echo” includes “four” terms – “smooth walled,” “irregular walled,” “well defined,” and “poorly defined.” The “internal echo” pattern includes “four” terms – “hyperechoic,” “hypoechoic,” “isoechoic,” and “anechoic” [Figure 1]. The “distribution of internal echoes” includes “two” terms – “homogeneous” and “heterogeneous.” The “posterior wall echoes” includes “four” terms – “enhanced,” “intermediate,” “unchanged,” and “unable to classify.” The vascularity includes “two” terms – “avascular” and “increased.” The sonographic pictures were interpreted by the operator (sonologist), and findings were entered. The ultrasonographic diagnosis was obtained and noted on the pro forma. Then, the patients were made to undergo FNAC and/or biopsy for histopathologic examination and confirmation of diagnosis. The results of ultrasound were correlated with clinical and histological findings and were statistically analyzed using Chi-square test and contingency coefficient. The study participants were totally 30 in number and were in the age range of 15–70 years with average age 31.91 ± 15.55 years. There were 20 (66.67%) males (age – 31.53 ± 12.91) and 10 (33.3%) females (age – 32.40 ± 19.20) with a male to female ratio of 2:1 [Table 1]. Chi-square value obtained is 27.60 and P value for this Chi-square test is less than that of 0.05. It indicates that the cases are not equally distributed in all categories, and the study had maximum number of patients with cysts followed by lymphadenitis. Chi-square value obtained is 22.80 and P value for this Chi-square test is less than that of 0.05. It indicates that the cases are not equally distributed in all categories and the study had maximum number of patients with cysts followed by lymphadenitis. A significant association was observed between clinical diagnosis and ultrasonographic diagnosis (contingency = 0.872, P < 0.05). There was 100% congruency between clinical diagnosis and ultrasonographic diagnosis in all the cases except in cases of cysts, abscess, and sialadenitis. There was 93% congruency noted in a case of cysts, 80% in cases of abscess, and 0% in a case of sialadenitis. Overall reliability of USG was found to be 90% in diagnosing all the cases with respect to clinical diagnosis. A significant association was also observed between ultrasonographic diagnosis and histopathological diagnosis (contingency = 0.904, P < 0.05). There was 100% congruency between histopathological diagnosis and ultrasonographic diagnosis in all the cases except in a case of benign odontogenic tumor. There was 50% congruency noted in a case of benign odontogenic tumor. Overall reliability of USG was found to be 97% in diagnosing all the cases with respect to histopathological diagnosis. A significant association was observed between clinical diagnosis and histopathological diagnosis (contingency = 0.888, P < 0.05). There was 100% congruency between clinical diagnosis and histopathological diagnosis in all the cases except in cases of abscess and sialadenitis. There was 80% congruency noted in cases of abscess and 0% in sialadenitis. 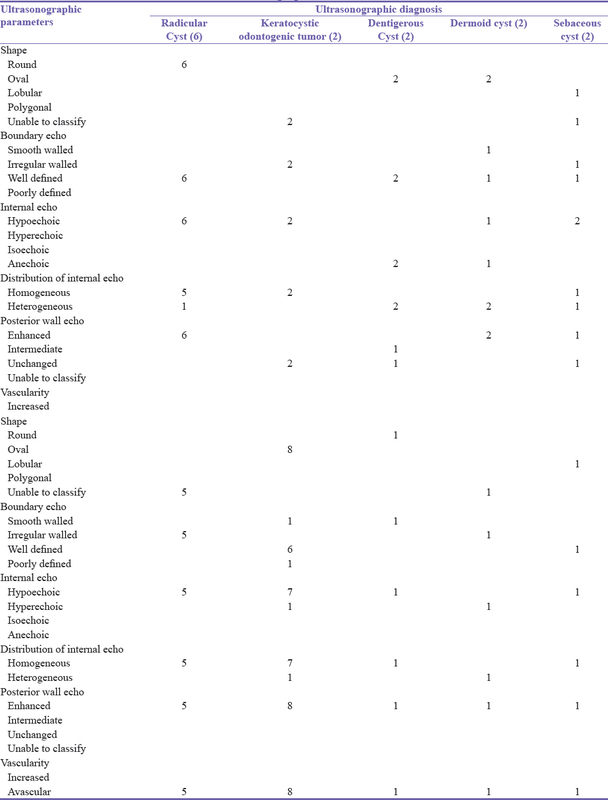 The ultrasonographic features of various lesions were summarized [Table 5]. Ultrasonography, which for long remained the preserve of basic research, has over the past few years emerged as an important tool for a variety of applications in the field of medicine. It has been applied for diagnosis in orofacial region in very recent years, but it is not routinely used. USG is capable of differentiating cystic from solid lesions and is also helpful in diagnosing malignant from benign lesions. The sonographic images are identified in terms of echoes as hypoechoic, hyperechoic, isoechoic, and anechoic images. A mass is hypoechoic if it has intensity lower than that of the adjacent tissue. Hyperechoic is used for masses of higher intensity, and isoechoic is used for masses with intensity similar to the adjacent tissue. The appearance of hypoechoic masses is darker whereas the hyperechoic masses appear rather bright and the isoechoic ones have a similar appearance. A calcified mass appears hyperechoic, and clear fluid or blood appears anechoic., Anechoic means that it does not have or produces echoes. Cysts on the sonogram usually appear anechoic, but if they become infected, then the content of the lesion can produce some echoes resulting in hypoechoic appearance. 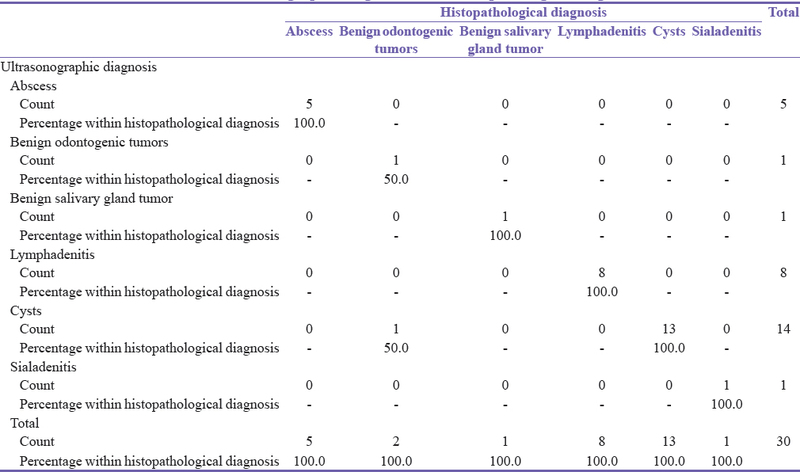 Based on the 6 parameters in the present study, USG features of all the 30 cases were tabulated and USG diagnosis was obtained [Table 4]. The present study revealed that on USG, all the cases of radicular cysts (RC) exhibited hypoechoic appearances. These findings are in accordance with the findings of Chandar and Venkateswarlu and Tiwari et al. Hypoechoic appearance was noted in both the cases of odontogenic keratocyst in the present study. These findings coincide with the studies of Lauria et al., Chandar and Venkateswarlu, and Bagewadi et al., respectively. Bagewadi et al. in their study found dentigerous cysts (DC) exhibiting anechoic to focal hyperechogenecity. This focal hyperechogenecity in the anechoic area of the DC was the tooth portion which helps to differentiate between RC and DC. In the present study, both the cases of DC showed anechoic internal echoes. Similar findings were also reported in the literature by Chandak et al. and Pinto et al. In cases of dermoid cysts, one case showed anechoic and another showed hypoechoic internal echo in the present study. The findings of the present study are in accordance with the studies of Akinbami et al. and Ariji et al. In cases of sebaceous cysts, both cases showed hypoechoic internal echoes. In our study, all the cases of abscess showed hypoechoic echo pattern. These findings were similar to the studies done previously in the literature by Chandar and Venkateswarlu, Chandak et al., Kamble et al., and Saeed et al., respectively. Out of the 8 cases of lymphadenitis, 7 cases showed hypoechoic and 1 case exhibited hyperechoic pattern. These findings are in agreement with the studies of Chandar and Venkateswarlu, Bagewadi et al., Dayanand et al., Chandak et al., and Singh et al., respectively. One case of sialadenitis was also diagnosed ultrasonographically in the present study which showed hypoechoic internal echo pattern. Similar hypoechoic appearances in sialadenitis were also reported in the studies of Bagewadi et al., Chandak et al., and Kamble et al. Bagewadi et al. in their study have observed hyperechoic to anechoic internal echo pattern in all the cases of ameloblastoma. However, in studies done by Lauria et al. and Chandar and Venkateswarlu, ameloblastoma was found to show only a hyperechoic pattern. Similarly, even in our study, one case of ameloblastoma was found to demonstrate a hyperechoic pattern. We had ultrasonographically diagnosed one case of pleomorphic adenoma (PA) which showed a hypoechoic pattern which is similar to the findings by Chandak et al. and Kamble et al. However, Akinbami et al. in their study found hyperechoic pattern in 4 of their cases and hypoechoic pattern in only one case report. These differences have been attributed to the different constituent cells and tissues, which may be present in PA and the level of histological differentiation of the tissues. There are numerous studies in the literature comparing USG with clinical diagnosis or USG with histopathological diagnosis but a very few studies comparing all the three modalities together. Hence, in this present study, we correlated the ultrasonographic diagnoses of all cases with the clinical diagnosis and histopathological diagnosis. In three of the cases, USG diagnosis varied with the clinical diagnosis. USG was found to be 90% reliable in diagnosing all the cases in the present study with respect to clinical diagnosis. However, in only one case, USG diagnosis varied with the histopathological diagnosis. Hence, the reliability of USG was found to be 97% in diagnosing all the cases with respect to histopathological diagnosis. 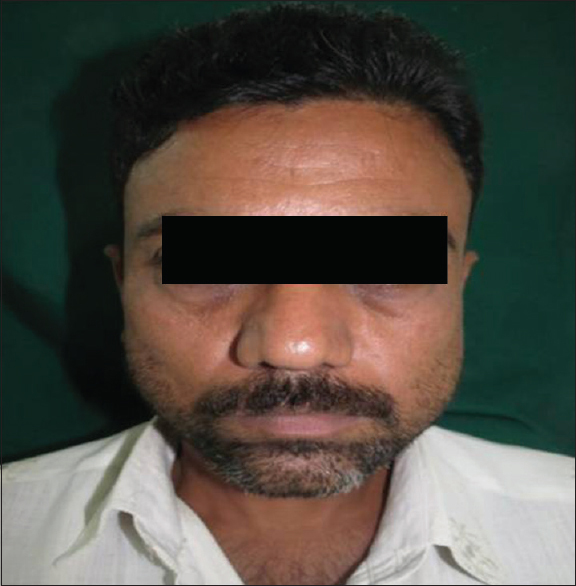 In the present study, one of the case which was diagnosed clinically as a lymph node swelling was on USG diagnosed as sialadenitis; and later on, histopathologically proved to be a sialadenitis. Similarly, another case of clinically diagnosed lymph node swelling was found to be an abscess on USG and histopathologically. One of the cases in our study was clinically diagnosed as benign odontogenic tumor which histopathologically proved to be unicystic ameloblastoma, but on USG, it appeared as a cystic lesion [Figure 2] and [Figure 3]. This gives credence to the fact that the true nature of the disease process cannot be determined ultrasonographically. A significant association was observed between clinical diagnosis and ultrasonographic diagnosis (contingency = 0.872, P < 0.05). There was 100% congruency between clinical diagnosis and ultrasonographic diagnosis in all the cases except in cases of cysts, abscess, and sialadenitis. There was 93% congruency noted in a case of cysts, 80% in cases of abscess, and 0% in a case of sialadenitis, respectively. A significant association was also observed between ultrasonographic diagnosis and histopathological diagnosis (contingency = 0.904, P < 0.05). There was 100% congruency between histopathological diagnosis and ultrasonographic diagnosis in all the cases except in a case of benign odontogenic tumor. There was 50% congruency noted in a case of benign odontogenic tumor. USG is found to be over 90% reliable in diagnosing all the cases in the present study with respect to clinical diagnosis and histopathological diagnosis. A significant association was observed between clinical, ultrasonographic, and histopathological diagnoses. However, further studies with more sample size including various other swellings may contribute toward reinforcing the efficiency of diagnostic ultrasonography in the orofacial region. Bagewadi SB, Mahima VG, Patil K. Ultrasonography of swellings in orofacial region. J Indian Acad Oral Med Radiol 2010;22:18-26. Chodosh PL, Hillside NJ, Silbey R, Oen KT, Elizabeth NJ. Diagnostic use of ultrasound in diseases of the head and neck. Laryngoscope 1980;90:814-21. Eswar N. Ultrasonographic evaluation of salivary gland diseases. Indian J Dent Res 2001;12:206-10. Chandar VV, Venkateswarlu M. Utility of ultrasonography as adjunct to diagnosis in certain orofacial lesions over the clinical and radiological evaluation: A comparative study. J Indian Acad Oral Med Radiol 2009;21:12-6. Tiwari B, Krishnan M, Popli M, Iyer S, Arora V. Ultrasonography and color Doppler in the differential diagnosis of periapical cyst and granuloma. J Contemp Dent 2014;4:17-21. Lauria L, Curi MM, Chammas MC, Pinto DS, Torloni H. Ultrasonography evaluation of bone lesions of the jaw. Oral Surg Oral Med Oral Pathol Oral Radiol Endod 1996;82:351-7. Pinto AS, Araújo TL, Dias SF, Guimaraes MA, Pinto MS, Lopes SL. Imaging aspects of dentigerous cyst through magnetic resonance imaging and ultrasound. Braz Dent Sci 2014;17:105-10. Akinbami BO, Ugboko VI, Owotade EJ, Obiechina AE, Adetiloye VO, Ayoola O, et al. Applications of ultrasonography in the diagnosis of soft tissue swellings of the cervicofacial region. West Afr J Med 2006;25:110-8. Ariji Y, Maeda H, Naitoh M, Gotoh M, Izumi M, Aimiya H, et al. Ultrasonographic evaluation and differentiation of timorous lesions in the floor of the mouth: Case reports and review of the literature. Oral Sci Int 2006;3:35-44. Kamble RC, Joshi AN, Mestry PJ. Ultrasound charecterization of salivary lesions. Int J Otorhinolaryngol Clin 2013;5:77-90. Saeed SS, Ibraheem UM, Alnema MM. The efficiency of ultrasound and Dopplor ultrasound in differential diagnosis of periapical lesions in Iraqi populations. Int J Enhanced Res Sci Technol Eng 2014;3:72-9. Dayanand SM, Desai R, Reddy PB. 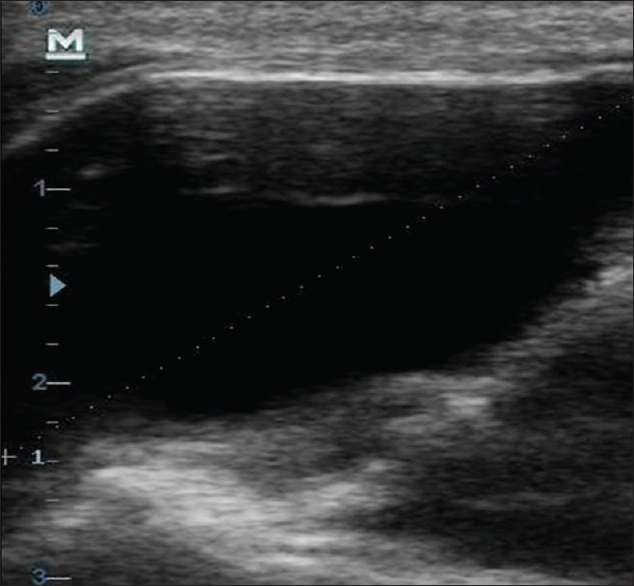 Efficiency of ultrasonography in assessing cervical lymph node metastasis in oral carcinoma. Natl J Maxillofac Surg 2010;1:117-22. Singh GP, Dogra S, Kumari E. Ultrasonography: Maxillofacial applications. Ann Dent Spec 2014;2:104-7.